The interfaces built with OWGIS allows filtering the content using the Contextual Query Language. With these feature scientist can easily filter data. 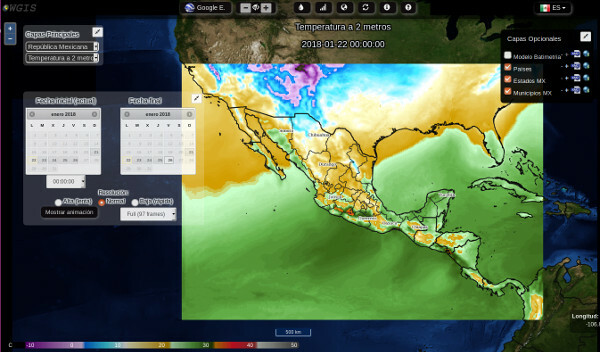 When the main layer is being retrieved from a ncWMS server, OWGIS builds the necessary web content to allow the user selecting from the available color palettes on the server. 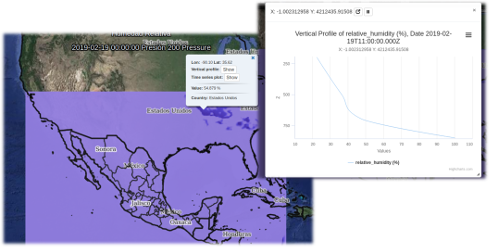 For 3D data served through ncWMS servers, OWGIS makes the proper requests to generate vertical profile graphs. 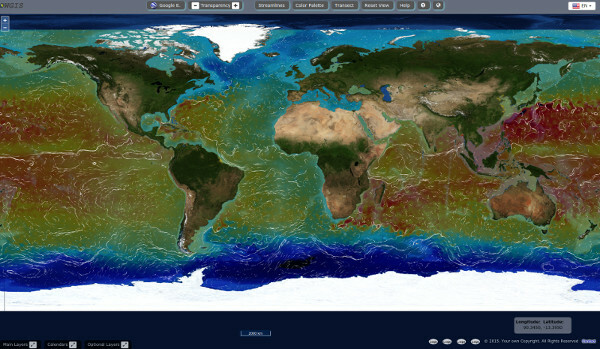 3D view using WebGL with the Open Source software Cesium. OWGIS builds a nice paginated window for selecting different z-axis of 3D layers. Just one click and any of your layers will be downloaded as a KML file, which can be visualized in other clients like Google Earth. 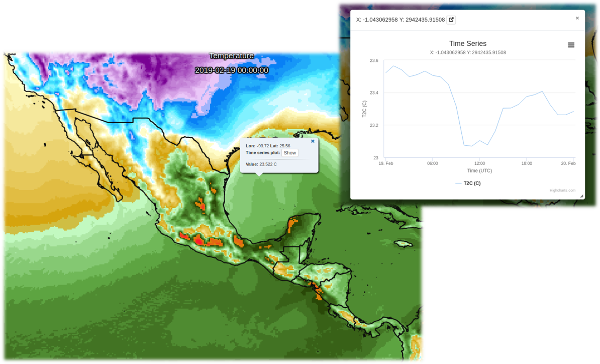 If your data varies on time, OWGIS takes advantage of the ncWMS servers and provides time series from the time range selected through calendars. 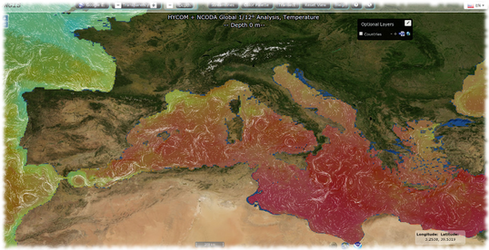 Depending on the layers that are being visualized by the WebGIS site, you can access its data at any location by simple clicking on the map. 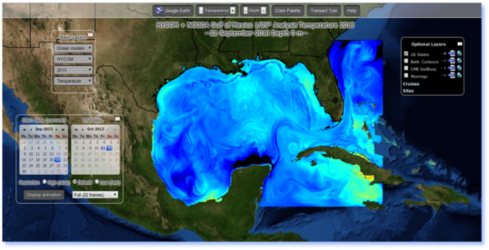 Newest version of OWGIS can generate streamlines to visualize currents, winds, or any other vector field. A new section has been added with tutorial videos on the use of OWGIS and some of its features and tools. Do not forget to take a look and learn about the use of these tools in OWGIS. Test the air quality forecast in your smart device! 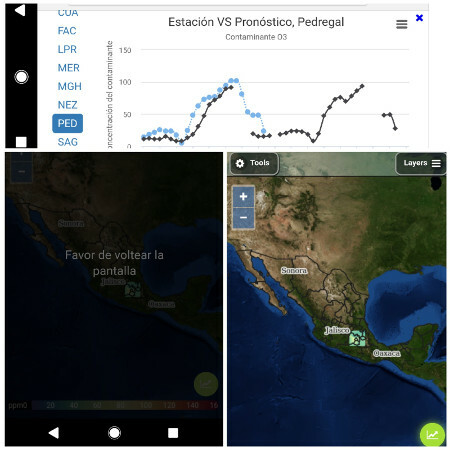 Now you can check the air quality forecast with neural networks in your smart device, with the new interface optimized for these devices. Test it from your smart device. New OWGIS users has been added! 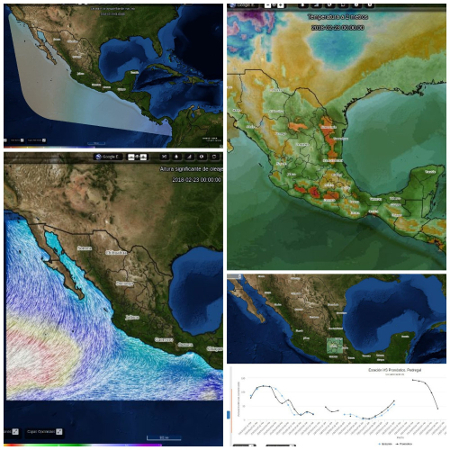 New users of OWGIS as the meteorological forecast of the ioa group of the atmospheric science center (CCA, UNAM), as well as the forecast of storm tide, the forecast of waves and the forecast of air quality trained by neural networks and more, they have been added to the USERS section. 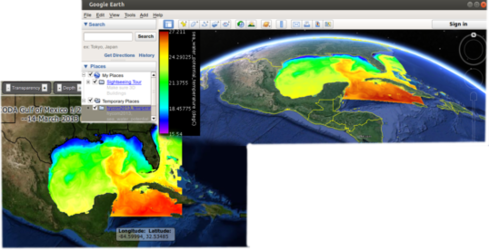 OWGIS 2 has been published! The paper of version 2.0 of OWGIS has been published, do not forget to take a look to learn more about it. 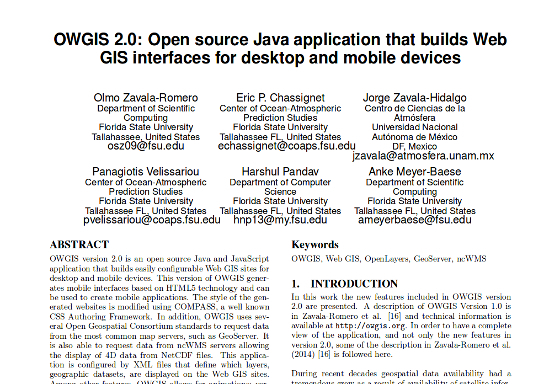 Please dont forget to reference the published paper in any other publication which uses OWGIS to create Web GIS sites. 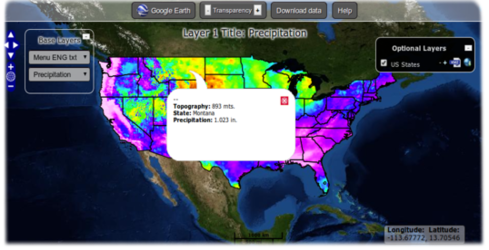 OWGIS has been refactored to use OpenLayers 3, CSS3, canvas animations and more!. In addition to these new features, the configuration of OWGIS 2 has been noticeably modified from the previous version. Additional information on OWGIS 2 can be found here. 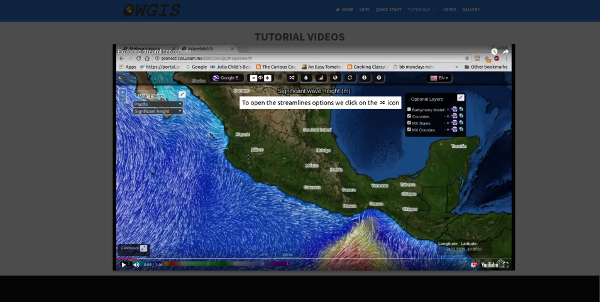 We will start updating this website to include tutorails for OWGIS 2. The following image shows the new look for some of the controls in OWGIS 2. We are finalizing the new version of OWGIS. We will update the documentation soon! The new version allows the maps to be displayed in 3D using the Cesium Open Source project. You can enable the 3D view by clicking the icon ,on the toolbar. ncWMS 2 is here to stay! We finally have support for ncWMS 2, this means that we can have streamlines natively from any vector fiedl served from ncWMS 2. In order to use it just add the following attribute into your layer declaration ncWMStwo="true". The next version of OWGIS will display vector fields with live streamlines! 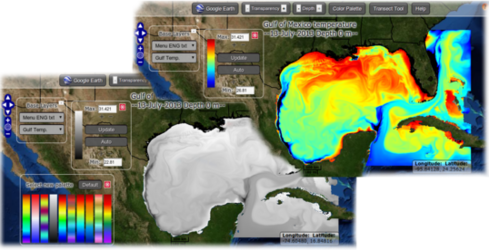 Following the ideas of Cameron Beccario and his great world visualization tool earth, OWGIS is now able to display winds and currents as streamlines. Besides the initial idea of Cameron, OWGIS changes the resolution of the data depending on the area been visualized... if you zoom in you get higher resolutions. It also allows for displaying the streamlines together with animations forming path lines that follow the vector fields through time. 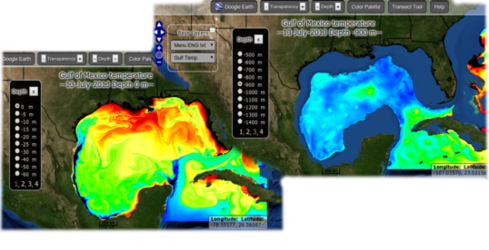 Finally the streamlines can be displayed at different depths if the data contain multiple depths. 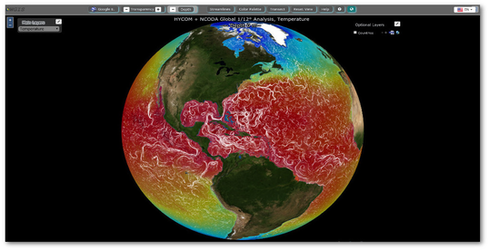 As an example take a look at this awesome project that shows the global currents from the HYCOM ocean model using OWGIS. Thanks to ncWMS2, now we are able to visualize output from unstructured meshes! 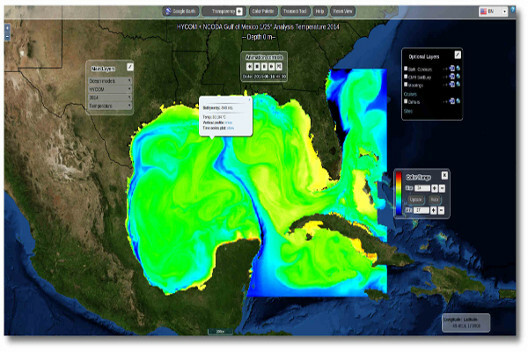 Take a look at the following link that shows data from the coastal model ADCIRC and OWGIS. 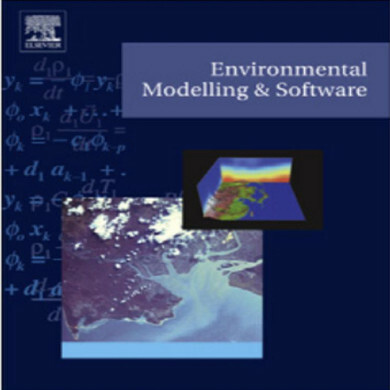 You can see the paper at Environmental Modeling Software!. Please reference the published paper in any other publication which uses OWGIS to create Web GIS sites.